Photosynthesis is one of the most important processes that affects all life on Earth, and, even now in the twenty-first century, it is still being studied and tested by scientists, chemists, and botanists. Regardless of politics or opinion, climate change is one of the most polarizing and important, potentially dangerous, issues facing the future of our planet, and a better understanding of photosynthesis, and how it is changing with our global climate, could hold the answers to many scientific questions regarding this important phenomenon. 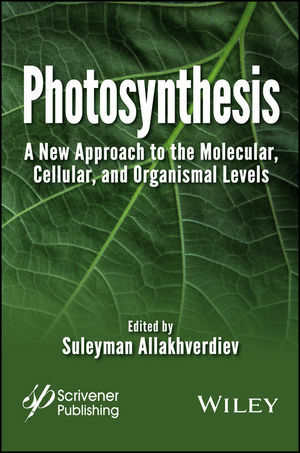 This edited volume, written by some of the world’s foremost authorities on photosynthesis, presents revolutionary new ideas and theories about photosynthesis, and how it can be viewed and studied at various levels within organisms. Focusing on the molecular, cellular, and organismic levels, the scientists who compiled this volume offer the student or scientist a new approach to an old subject. Looking through this new lens, we can continue to learn more about the natural world in which we live and our place in it. Valuable to the veteran scientist and student alike, this is a must-have volume for anyone who is researching, studying, or writing about photosynthesis. There are other volumes available that cover the subject, from textbooks to monographs, but this is the first time that a group of papers from this perspective has been gathered by an editor for publication. It is an important and enlightening work on a very important subject that is integral to life on Earth. Suleyman I. Allakhverdiev, PhD, is the Chief Research Scientist at the Institute of Basic Biological Problems (IBBP), Russian Academy of Sciences. He is on the editorial boards of the International Journal of Hydrogen Energy and The Open Structural Biology Journal and has been a guest editor on four other journals. ?He has authored or co-authored over 300 papers in various scholarly journals and holds 11 patents. He has been working as a visiting professor in over 30 countries and has presented papers at more than 70 international and national conferences. ?He has also organized two international conferences on photosynthesis.